Herald describe themselves as a British company that designs, builds and creates stylish, yet simplistic, vintage-themed motorcycles. And there is a refreshing honesty about the way they conduct their business. Herald aren’t trying to pull the wool over anyone’s eyes, it admits exactly what it is, so let’s get to the nitty gritty. Although Herald are based in Cambridgeshire their products are built in China. Herald went to a Chinese trade show, picked a retro-looking 250cc air-cooled Chinese motorcycle and simply got its name put on the tank before it was imported into the UK. But here is where the company has separated itself from most other Chinese bike importers. Not only is the company’s base model (which is called the Classic) quite good looking to start with, Herald then make it even better. Having dealt with Chinese scooters for several years before Herald was set up, the firm knows the issues that can plague imported bikes. Before a customer takes delivery of their new bike, Herald swap the oil, replace the rear shocks for fully adjustable items, fit a new chain and sprockets, change the brake pads, lose the Chinese sparkplug for a pukka NGK item and, finally, junk the hideous Chinese tyres for a recognised European brand. And then the fun really starts. While you can simply opt for the basic Classic model for £2750, spend £3500 and you can get either the Rambler, Vagabond, Nomad or Roamer. 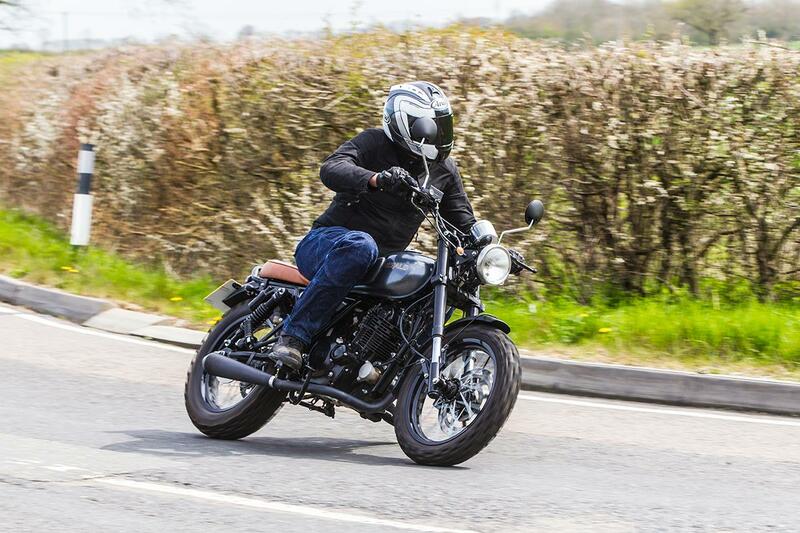 Using the Classic as a platform, Herald have designed and developed four variations that not only up the specification of the bike, they massively increase the fun factor. 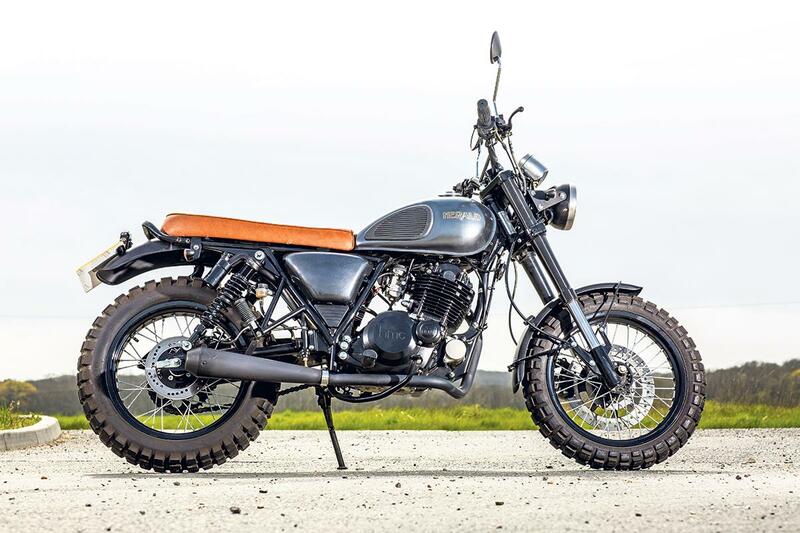 And noise!The Rambler is a take on the current hot trend of urban scramblers. As well as a matt black exhaust, you get a brown seat, high off-road style bars, an LED tail light, rubber knee pads on the tank and Continental Twinduro knobbly tyres. Styling-wise, Herald have hit the nail on the head as the Rambler does look very minimalist, stripped-back and cool with a hint of rat bike about it. But what really makes you smile is the fact that it has a fuel tap and even a single carburettor. Remember them? Next year the model will have to meet Euro4, and ABS will need to be fitted alongside more eco-friendly fuel injection, but the carburettor is certainly a major part of the 2016 Herald’s charm. On the go that air-cooled engine, which is a re-badged Suzuki GN motor, does all that is asked of it. With only 21bhp to play with it’s not overly rapid, but will thrash its way up to 70mph and doesn’t vibrate that badly. As a town bike its performance is perfectly acceptable - the clutch is light and the five-speed box relatively slick. But get it out of town and the Rambler can be a little off-putting as faster traffic encroaches on the sense of fun. Although Herald have swapped the shocks for better items, the combination of poor quality Chinese front fork, knobbly tyres and a dry weight of 130kg makes the Rambler’s handling slightly wayward. The front-end feels very remote and cornering on the knobbly tyres is an unnerving experience due to the bike’s light weight and the tyre’s chunky tread pattern, especially at speed. Much of this skittish feeling is down to the fashion-pleasing tyres (the other models have more road orientated Avon Distanzia rubber and deal with bends far better) but it robs you of confidence. Although, oddly, it didn’t detract too much from the overall experience. There are areas on the Rambler where the Chinese workmanship is very evident – the finish on some of the nuts and bolts is terrible, the clutch actuator arm is cheap and the fork is decidedly sub-optimal – but despite all this I really enjoyed riding it. Customs should feel a bit raw and like they have been built in a garage – and that’s how the Rambler feels, which is why I call it honest. The loud pipe adds to its charm, the carb means you can rediscover the lost art of the backfire (which never gets dull) and the looks and attitude are bang-on. The Rambler (or any of the Heralds for that matter) isn’t a polished identi-kit machine, it’s a hand-modified bike that takes a fairly mundane base and injects a healthy does of fun and spirit. For that alone Herald need to be applauded. Is it worth the £3500 asking price? If you want a short hop bike that stands out, the Rambler does offer far more in terms of style and fun than a basic Japanese commuter while actually containing a solid and reliable motor. It doesn’t set the world on fire in terms of technology or refinement, and machines such as the Benelli BN251 ride far better, but it is genuinely fun to ride, and now comes with a 2-year warranty, too. The Rambler’s handling is a bit wayward, but it’s an oddly charming and honest custom that is light, manoeuvrable and genuinely appealing. The finish is poor in areas, but its fun attitude and cool styling makes up for most of its shortcomings.